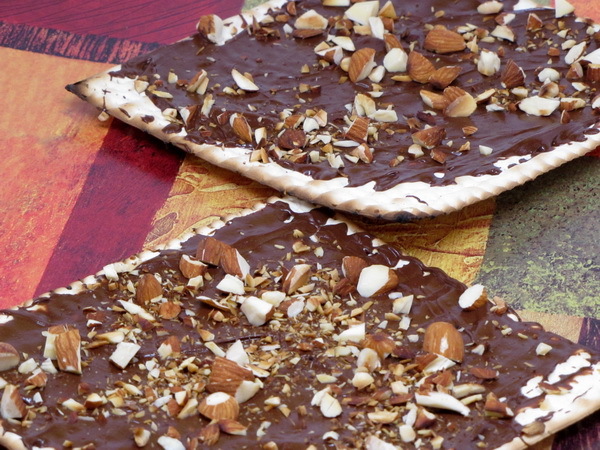 This chocolate bark is made with matzah crackers and it is just delicious – – and the prep time is only 5 minutes ! This is great to serve as a dessert when you have company. If you don’t like almonds, use any chopped nuts. Place chocolate in microwave and cook on high 1 minute. Stir and cook another 30 seconds. Mix well assuring it is all melted and no chunks are left. Pour over crackers and spread with a spatula until well covered. Sprinkle with almonds and press them into the chocolate so they stick well. Let stand until hardened and then cut into 4 pieces each. 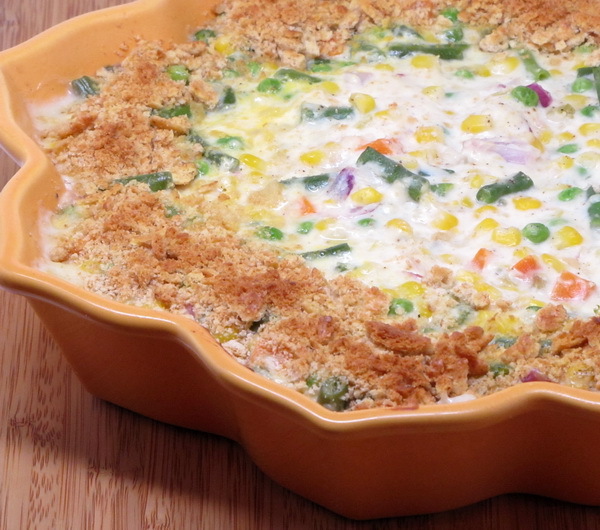 I like when you can take a healthy vegetable and disguise it enough that you can get a picky kids to eat it 🙂 This one has enough cheese and crumbly topping to make it disappear ! Preheat broiler. Boil water and add carrots. Simmer for 8 minutes then add broccoli and simmer another 3 minutes. Drain and place in a bowl. Microwave Velveeta and cream cheese on high 1 minute then stir and cook another 30 seconds or until completely melted. Pour on top of veggies. 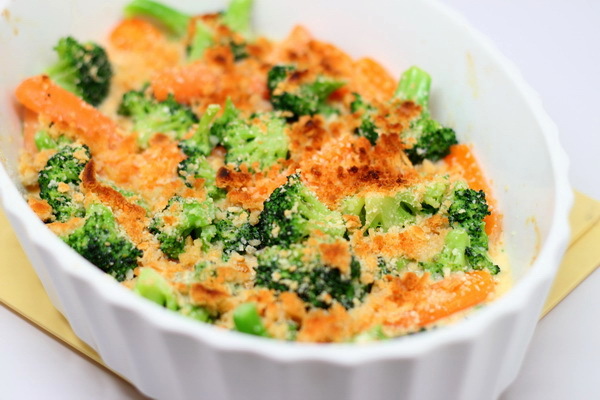 Mix crackers and parm and butter and sprinkle on top of the veggies and cheese and place under broiler for 2-3 minutes to brown the crumbs. 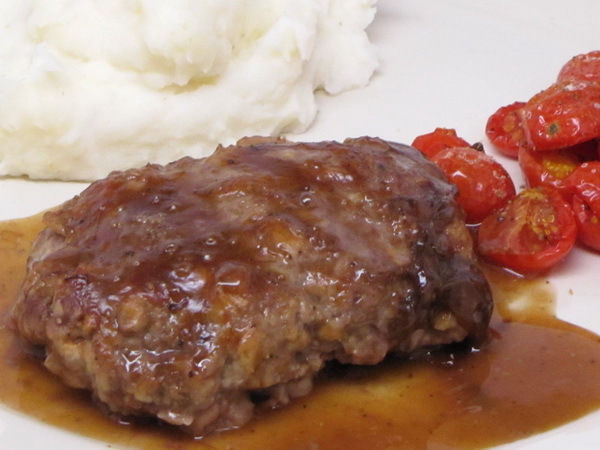 This is a favorite of frozen dinner makers and I still remember the taste of good old Swanson TV Dinner Salisbury Steak. This one is much better ! 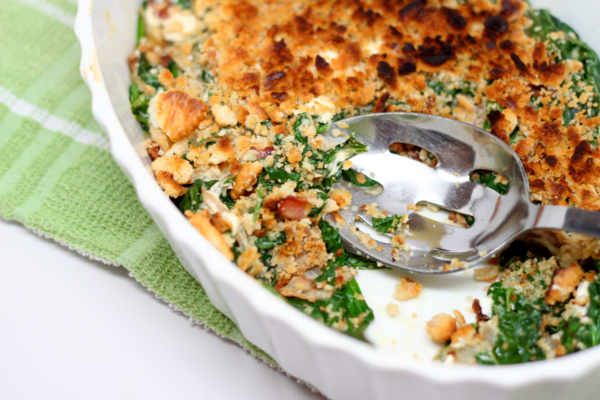 The recipe is easy to make and gives you a great result time in and time out. Try serving with 1/2 c mashed potatoes and some Roasted Grape Tomatoes and you meal comes in under 400 calories ! Preheat oven to 350 degrees. Mix milk, crackers, onion, and parsley and then add the meat and make into 4 oval patties and place in a baking dish sprayed with Pam. Whisk gravy, ketchup , Worcestershire and pepper and pour over the meat and cook 55 minutes or until meat is done. 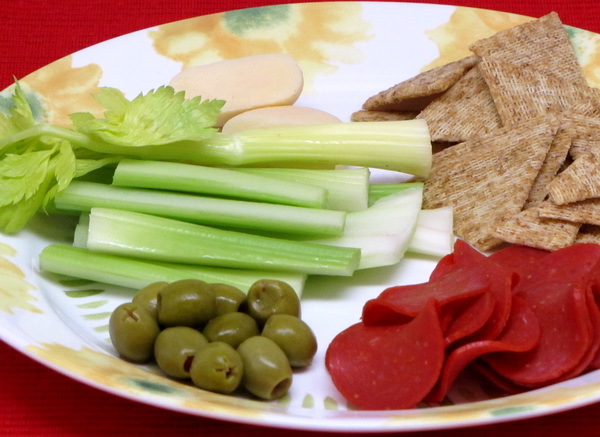 Sometimes I just don’t want a prepared meal – I want to pick like I am eating appetizers at a party. This dish is also a great snack if you have the calories left from eating a lighter lunch and dinner that day. Add more veggies (carrots, radishes, cucs) to make it larger without adding many more calories.